Although it’s nearly August, kale is still producing in large quantity in our little garden. And the basil. Oh my goodness, the basil! I went a little overboard with basil this year, planting six varieties. A few of them have grown into full-blown bushes. So what’s one to do with all of this kale and basil? Make pesto! I’m making pesto to eat right now as well as freezing pesto to eat in the months when we aren’t lucky enough to have all of the garden-fresh goodness we are enjoying right now. It’s super easy to freeze pesto and have the fresh flavors of summer in the middle of winter. A few quick words about the kale in this pesto. You can use any variety of kale. In the batch shown in the photos, I used a combination of Lacinato and Scots kale, sometimes referred to as curly kale. I know kale can be a tough sell, some folks just don’t like the flavor of it. This late into the growing season, the flavor can be more bitter than the springtime baby kale. No worries, all of the other flavors in this pesto mellow out the kale. In fact, some might not even know there is kale in this pesto. I’ve included ingredients in this pesto to make it more likely for our bodies to absorb the good stuff in the kale. I’ve added in lemon juice to make the iron more easily absorbed and olive oil to make the fat-soluble carotenoids more likely to be used. Plus these traditional pesto ingredients just taste good. How can you resist a tastes-great combination that is also good for you? 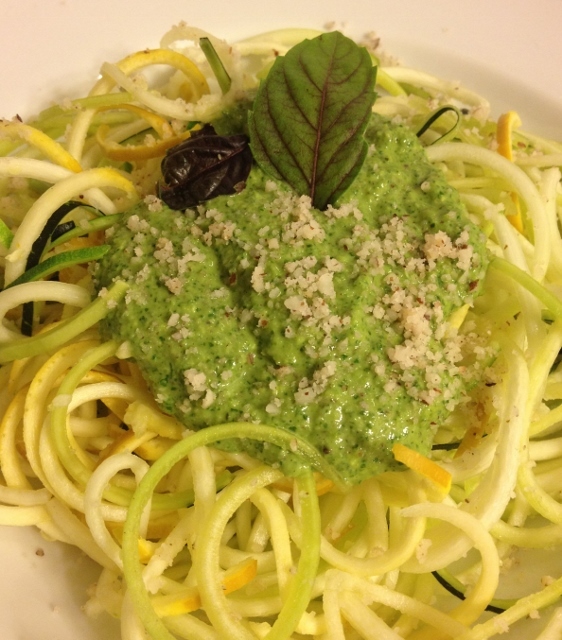 I like this pesto with zucchini noodles, cut with The Noodler. It’s also great with traditional pasta and on eggs. Honestly, I eat it on about anything this side of cupcakes. I’d love to hear from you. How do you eat pesto? In bowl of food processor, fitted with "S" blade, combine all ingredients except olive oil. Process until ingredients are nearly a paste. Add in 1/3 cup of olive oil, streaming into the bowl of the food processor while it runs. 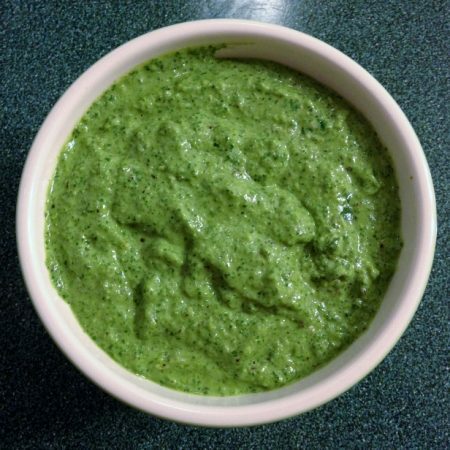 If you are freezing the pesto, stop here, remove the pesto from the food processor and place in your freezer container. Pour remaining oil on top of pesto and freeze. If making pesto to eat now, add in the remaining 1/3 cup of oil while the food processor runs. You may not wish to use all of the oil, stop when it reaches the consistency you like. *If you are using regular dairy parmesan and making pesto to freeze, you may prefer to not add the cheese to the pesto until you are ready to eat it. Just make a note on top of your freezer container to add in 1/2 cup parmesan when ready to eat. Brazil nut parmesan freezes well, dairy cheeses may not freeze in the same manner. Well that looks really yummy! Might try with walnutz also. I think it would work really well with walnuts or pecans. Next basil harvest, I may try it with pumpkin seeds. After a rather slow start our basil went crazy. I made so much pesto this summer it’s crazy. Pesto chicken, Pesto pizzas, Pesto pasta dishes with salmon. Been using this parmesan cheese that comes from Argentina, very nutty and now and now and then aged Gouda, YUM! Going to try making zucchini pasta like you make one of these days. Oh I also wondered why you adding basil and didn’t use all kale? I think adding pepper flakes would have been good also. 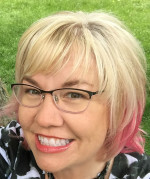 Thanks for your wonderful foodie blog, I don’t always post but I do read most every post. I do think it’s possible to make this with all kale, but I like the flavor of basil and have a HUGE abundance of it right now. Our garden started off really slow this year but now I’ve got something that resembles a privacy hedge of basil. 🙂 Thanks for reading along, it means a lot to me! I love a bit of sneaky kale, Shirley!